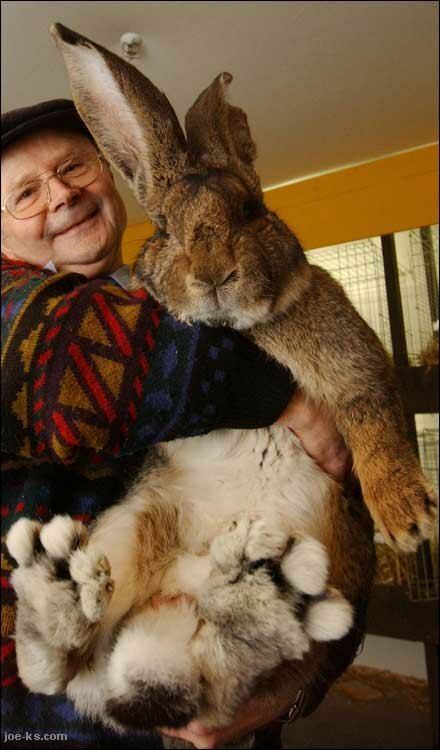 Herman the German Giant is not your typical rabbit found in Germany. He's not of the variety Germans find nibbling at the cabbage in their garden or bouncing through the forest. Herman is owned by a breeder in Germany who raises Grey German Giants, usually bred for fur and meat, and he weighs in at 22 lbs. Just look at those feet! Holy cow! That rabbit is huge! that is the most amazing rabbit EVER! following you back thanks for the follow. Hi Sonja :) Great pic.....I've seen this one before and wonder if its a true picture?! He's a big ol bunny thats for sure! I love that rabbit!!!!! Thanks for dropping by my blog. Following you back!!! Thanks for stopping by Emma's Lunch. I'm a new follower. I want to give Herman one massive hug! Look how cute and cuddly he is!